John Key NZ Prime Minister and Tony Abbott Australian Prime Minister – cannot sort it! It was one year ago today that I wrote for my daily column a story on the mobile phone disaster when our young people travel â either way â across the Tasman. The telco's take us for a ride. And the issue of avoiding customs and making the flight across the Tasman a domestic affair rather than an International flight is going nowhere. Why they meet is beyond me, when they can't sort out these 'every day' issues that affect the ordinary person, with 2,000,000 (yes 2 million) people flying each year back and forth across the Tasman. The pair should be locked in a room, a hatch for meals and an open toilet, told the door will be unlocked when you two sort out this mess. Let me recap from last year. My guess is that I'll be repeating myself this time next year. No longer would there be the huge issues associated with international travel for the hop across the ditch. It sounded good and long overdue. Sydney to Auckland a domestic flight and in and out of the domestic airports. Christchurch to Melbourne the same. Brisbane to Wellington likewise, and so on. The travel links between Australia and New Zealand in Christian work â both ways - is phenomenal with a plethora of Christian conferences, ministry teams, outreach, welfare, ministry visits, preaching appointments, theological seminars and workshops, denominational meetings, ministry and mission meetings and the like. Then nothing happened - still nothing has happened. Clive Dorman's article seems to suggest the idea is dead-in-the-water and moreover it doesn't seem to be a New Zealand issue but squarely in the Australian "money bags" arena â are any of us surprised? He asked: "who would stand to lose tens or hundreds of millions of dollars if the Tasman suddenly became a common domestic sky? Of course! Australia's privatised airports.... Canberra has continued to treat travellers as a cash cow, increasing the PMC (international 'passenger movement charge') a further 11.7 per cent to $55 for all international travellers entering or leaving the country. That makes it the world's biggest travel tax for short-haul international routes â¦. Dorman concludes his article with this salutary statement: The Australian Travel and Transport Forum (TTF) is pleading with Canberra to cut the PMC, noting that in the first month of the new $55 charge (combined with NZ's $NZ25 departure tax), travel between Australia and NZ â collectively Australia's busiest international air corridor â fell 4.5 per cent in July. 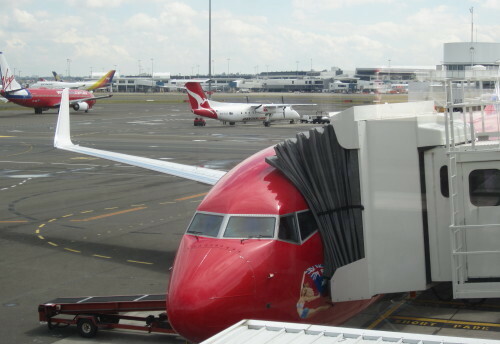 Cited was Bruce Buchanan the former Jetstar chief executive said the 'domestic move' would have reduced the typical trans-Tasman fares from around $200 to $140 â the same as comparable domestic routes in Australia like Melbourne or Sydney to Cairns. It would have changed the whole psyche of the trip, a domestic terminal with the 30-minute close-out. The first part of the communique is all cuddly as how special the two nations are relating to heritage and ANZAC and they'll try and standardise regulations and allow students from New Zealand parents in Australia access to student support. BUT - Trans-Tasman Travel - ".. ensuring that travel across the Tasman is as seamless and trouble-free as possible. Noting that eligible New Zealand and Australian citizens can use SmartGates in New Zealand for both arrivals and departures, Prime Minister Key welcomed Prime Minister Abbott's commitment to the expansion of Australia's SmartGate network for arrivals and a trial of automated departure gates at Brisbane Airport, which will commence in July 2014 focussing on trans-Tasman flights." I've used smart-gate. The line of people is still there. If these two can't do better than this in 2014, something smells horrible in the basement. As to mobile roaming - "Noting that these charges remain high compared to equivalent domestic services, the Prime Ministers' agreed they would continue work to provide respective regulators additional tools to use in this area, if required." There you have it from the horses mouth - young people, don't ring! You can't pay off both your mortgage and your phone. Every mission dollar saved is a dollar to be spent elsewhere. A recent article on the Gold Coast Airport illustrated (au.christiantoday.com) the enormous savings Christian mission has in cheap airfares and so much more - had this AustralianâNew Zealand 'domestic air' 2009 announcement been appropriated into the Parliament and approved. So here is another of these Australian and New Zealand political statements â one day one of these Prime Ministers' chit chats just might say, enough is enough. I'll be watching for flying pigs. Dr Mark Tronson is a Baptist minister (retired) who served as the Australian cricket team chaplain for 17 years (2000 ret) and established Life After Cricket in 2001. He was recognised by the Olympic Ministry Medal in 2009 presented by Carl Lewis Olympian of the Century. He has written 24 books, and enjoys writing. He is married to Delma, with four adult children and grand-children.